The following is the text of the intervention Rebecca Norton of IBFAN-GIFA gave at the Nestlé shareholder meeting on 7 April 2016. Click here for the text in French – pdf. This is followed by the response from Nestlé Chairman, Peter Brabeck-Letmathé. Click her for Baby Milk Action’s press release. Ladies and gentlemen, members of the board, Mr. President, good afternoon. My name is Rebecca Norton. I am trained in public health and specialized in breastfeeding. I am speaking on behalf of the Geneva Infant Feeding Association, the international liaison office of IBFAN. In official relations with the World Health Organisation, we are also funded by the directorat of health of the Canton of Geneva. To mark this 150th anniversary, and World Health Day celebrated today, we would like to start by welcoming the fact that Nestlé, as stated on page 60 of the report “Creating Shared Value”, has finally recognized WHO’s international recommendations on breastfeeding, in full. This is a welcome change, for which IBFAN has been asking for a number of years. 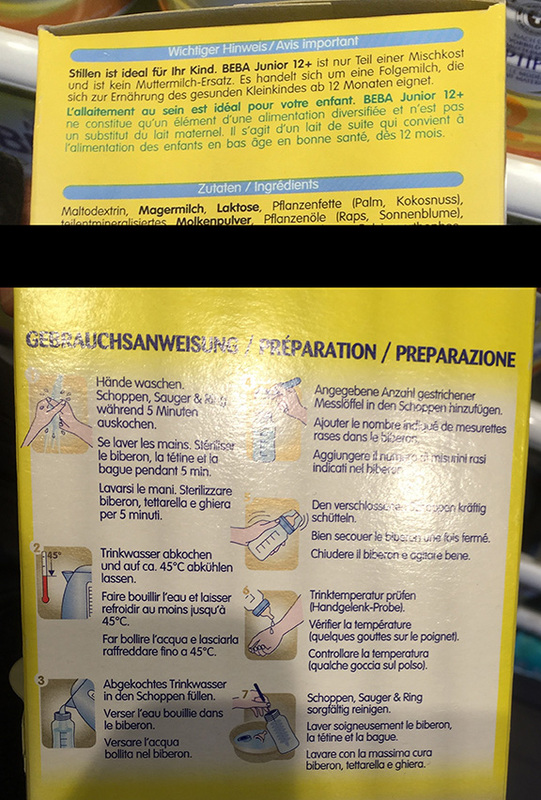 However: Why, here in Switzerland, as in many other countries, are parents still being misled by Nestlé’s marketing practices ? Why does one still read, on adverts or Nestlé products, that ‘WHO recommends exclusive breastfeeding during the first 6 months’? What about the second part of the WHO recommendations, to continue breastfeeding for 2 years or beyond ? Is this an omission ? Or is it a subtle marketing strategy to incite consumption of follow-on formulas? Yet, General Comment 15 on article 24, on the right to health, of the Convention of the Rights of the Child’s, clearly spells out the fact that the private sector has to conform at all levels to the International Code of Marketing of Breastmillk Substitutes and World Health Assembly resolutions. In February 2015, the United Nations Committee of the Rights of the Child also recommended to Switzerland to strictly apply the international code. Lastly, WHO, and recently UNICEF Switzerland, have clarified that follow-on milks are not necessary. When can we expect Nestlé to “walk its talk”, and to act upon all the nice declarations that we can read in the Creating Shared Value report ? What about the sound values and principles, the importance of respecting human rights and international norms – all of them nicely spelt out in this report ? Are they still valid when it comes to marketing ? If Henri Nestlé were still here today, with these same values, and if he knew everything we know today about the importance of breastfeeding for children, and mothers, everywhere in the work, including in Switzerland, would he not act differently, and strive instead to ensure that artificial milks, although useful for some, are ethically marketed in compliance with international standards and human rights? We dare to think that he would, and this 150th anniversary is for us the opportunity to ask Nestlé, once again, to honor its engagements by putting child health and rights before marketing and profits. Mr. Brabeck said that he did not dare ask Rebecca Norton when she was born, but that it seemed that the commitment that Nestlé has toward the WHO Code may date back to before she was born, and that we must not forget that it was Nestlé who recommended creating the WHO Code in the first place. He added that ever since it was established, Nestlé has been commited to respect the Code. He therefore said that it was exaggerated to come and tell him today that Nestlé respects the Code at last. He said that such a statement could only be explained by Rebecca Norton’s youth and that he understood this. Note, Mr Brabeck misled his shareholders. Nestlé actually led the International Council of Infant Food Industries in opposing the Code drafted by WHO and UNICEF as “unacceptable… irrelevant and unworkable”. 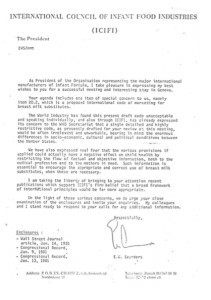 The 1981 letter by Nestlé Vice President, Ernest Saunders is given below (click for large version). Mr. Brabeck then asked Heiko Schipper, in charge of Nestlé Nutrition, to provide some additional information. Before Mr. Schipper took the floor, Rebecca Norton quickly pointed out that firstly, she was older than Mr. Brabeck thought and was born before the Code, and she also added that he must have known this very well. Secondly, she pointed out that when she was referring to the fact that Nestlé at last acknowledged the WHO recommendations in the Nestlé Creating shared value report, she was referring to the WHO recommendations on breastfeeding, i.e. exclusive breastfeeding until 6 months, and continued breastfeeding until 2 years or beyond. He started by reiterating the way in which Nestlé approaches human nutrition, especially in this special year. He highlighted the fact that Nestlé was committed to nutrition in the first 1000 days and that this included, as always stated by Nestlé, breastmilk as the best start in life. He pointed out that this commitment went back 150 years, if one were to read their first label and that this will remain at the heart of what Nestlé does. 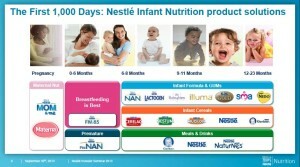 However, Baby Milk Action notes that in presentations to investors, Nestlé explains that its co-option of the first 1000 days message is to sell “product solutions” throughout this period – slide below from a presentation from September 2013. Both ATNI and FTSE4Good are flawed initiatives that look to company policies rather than compliance with the International Code on the ground. Nestlé has been told several times by FTSE to stop implying that inclusion in the FTSE4Good index signifies a company complies with the Code. Knowing FTSE4Good monitors companies against their own polices, not the Code, Nestlé weakened its policies shortly before being included. Details here. Lastly, he highlighted that Nestlé also takes concrete actions to promote breastfeeding. He said that most mothers in the world start breastfeeding but are often not able to sustain it until 2 years, a key reason for this being that they have to go back to work. In 2015, Nestlé put in place a policy so that globally all mothers who work in the company can take maternity leave until 6 months and all those who go back to work have the opportunity to continue breastfeeding in one of the 275 rooms on their premises. He ended by saying that this illustrates that not only do Nestlé has the strictest policies in place but also takes very concrete actions to support breastfeeding. Rebecca Norton congratulated Nestlé on what was done to for maternity protection, but added that Nestlé did not respect the WHO code in Switzerland. The label below shows that Nestlé claims its BEBA Junior formula for use from 12 months of age is not a breastmilk substitute – despite the product being fed in a bottle (a surrogate breast) and its claim to support the recommendation of breastfeeding into the second year of life and beyond. Nestlé declares such products are not breastmilk substitutes in an attempt to justify ignoring the ban on advertising them.